We supposedly live in a capitalist society where you get paid what you’re worth. However, that’s not the case in the NBA. In the NBA, the amount of time you have spent in the league dictates the amount of money that you are eligible to receive when signing a contract. For example, players with zero to six years of experience are eligible to sign for 25 percent of the salary cap, players with seven to nine years under their belt can ink for 30 percent, and players with 10 or more seasons of experience are eligible to sign for up to 35 percent of the salary cap. For some context, the salary cap this season was $101 million. Regardless of a player’s talent level or relative worth, the absolute maximum that a player could have earned this past season was a sliver over $35 million. Don’t get me wrong, that is certainly nothing to sneeze at, but in no world should Paul Millsap be making anywhere near the money that LeBron James is making. In the NFL, there is no maximum salary, which is the same for the MLB and the NHL. You are paid what you’re worth, or at least what teams feel you’re worth. The irony in all of this is that out of the four major leagues, an NBA player has the most direct effect on the outcome of games. In football, where a team has 22 starters, one player is less than five percent of his team’s starting unit. In hockey, the best player glides around in 20-second increments and plays no more than a third of the game. In baseball, you either get four at-bats or pitch every fifth day. Yet in all of these sports, there is no ceiling for the amount of money that one can earn. However, in the NBA, where you are one of five players on the court, and can (in theory) affect every single possession, there is a limit to the amount of money that you can earn. With all of this in mind, here are three crucial reasons why the NBA should abolish max contracts. 1. It would disperse the talent across the league. By eliminating max contracts, each team would be able to entice desirable players because they could offer them more money than another team that already has a superstar talent on their roster. For example, right now no one REALLY wants to play in Sacramento. I mean let’s be honest: they are putrid, and will be for the foreseeable future. But doesn’t that suddenly change when they can now offer *insert superstar* $50 million a year (or more) for their services? I think it does. It would also make all NBA games watchable because each team would have a player that fans want to see. Right now, there are only a handful of games that the casual fan will sit down and watch. Let’s play a game. Name just one player on each of the following teams: Chicago Bulls, Atlanta Hawks, Orlando Magic, Brooklyn Nets, Sacramento Kings, Phoenix Suns. Now, I have listed six teams (nearly 20 percent of the league), and I would mortgage my house (if I had one) that less than a handful of casual observers would be able to accurately name a player on each of those six teams. That’s a problem for the league. There should be no irrelevant franchises, and by doing away with max contracts, major strides could be made in that direction. 2. It would eliminate super teams. 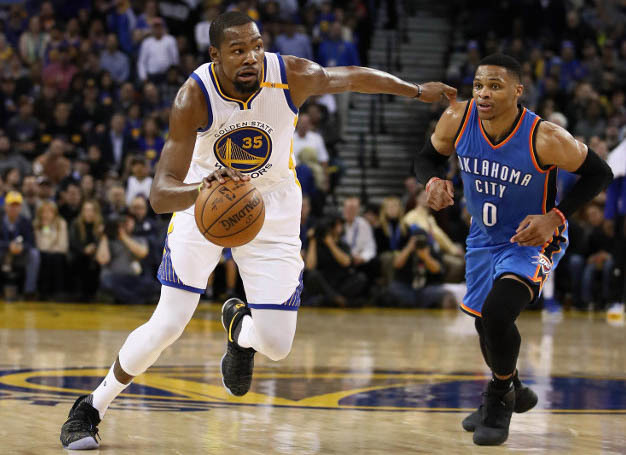 Do you really think Steph Curry or Kevin Durant would settle for $30 million when they would have offers of $50, $60, $70 million on the table? Maybe if they value winning that much, but I would go 0-82 before I turned down $70 million per year. I think the majority of players feel the same way. Let me say this: it was great to see the construction of a few super teams. Miami was nice with Wade, Bosh, and LeBron, Golden State is neat with their array of weapons, but are these powerhouses really good for the NBA? By eliminating max contracts, super teams would be unlikely to form and competitive balance would return to the NBA. 3. The strategic element would be absolutely fascinating. With a salary cap of $100 million, how much should you give LeBron? Do you pay him $90 million and fill out the remaining roster spots with the remaining $10 million? Or do you try and get him to take $50 million so you can surround him with competent teammates? I am not sure of the answer to that question, but general managers and front office executives would have to decide. The discrepancy in the value of particular players would differ drastically from team to team. Look at Russell Westbrook. Other than LeBron, he might be the most polarizing player in the NBA. But unlike LeBron, his value is often debated. Is Russ a winner? Or is he just a stat-chaser? I bet some teams would value him at $20 million per year, while others might go as high as placing a $60 or $70 million valuation on his services. When you lay it all out on the table, max contracts make little sense. Pay people what they are worth. It would add greater intrigue to a sport that is competing with the NFL for the most popular league in the United States. Getting rid of max contracts would scatter talent, eliminate super teams, and it would certainly make the decisions of front offices all the more interesting. There is a ton that the NBA is doing right, but the max contract situation is not one of them. Kelly Hogan can be reached at khogan@wesleyan.edu.